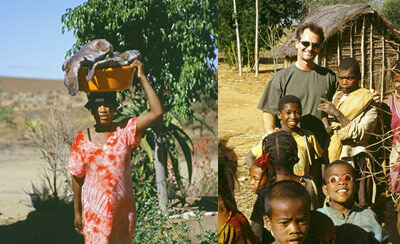 Above left: Malagasy woman carrying two large fish from the coast from over 200 miles away to hungry miners eager to pay. Fishing, farming and mining all bring income to the Malagasy people. Above right: Edward with the beautiful children of Madagascar. Edward was hired in 2003 by USAID, an independent federal government agency that receives overall foreign policy guidance from the Secretary of State to help bring resources and education to people in developing countries, increasing the benefit from their natural resources. Edward specifically worked together with Tom Cushman to help him engage the support of the World Bank to develop a gemological school equipped with modern gemoloical equipment and advanced instruction.